Sept. 12, 2018 (EcoSophia) -- This week we continue a monthly discussion of The Cosmic Doctrine by Dion Fortune, which I consider the most important work of 20th-century occult philosophy. Climb in and fasten your belts; it’s turning out to be as wild a ride as I expected. If you’re just joining us now, please go back and read the previous commentaries; the material covered in these earlier posts is essential to making sense of what follows. Revised Edition: Chapter 4, “The Building of the Atom,” p. 23-26. Millennium Edition: Chapter 3, “The Building of the Atom,” pp. 32-35, and the first two pages of the following chapter. The material in this chapter is easy to misunderstand, so it’s probably wise to revisit two points before going on. First, it’s essential to keep in mind the basic rule Fortune puts at the beginning of the text -- “These images are not descriptive but symbolic, and are intended to train the mind, not to inform it.” Second, this is a textbook of occult philosophy, not of physics. When Fortune discusses atoms in this chapter, she’s using the concept of the atom as a metaphor, not talking about atoms as imagined by the scientists of her time, or for that matter of ours. Too many students of The Cosmic Doctrine lose track of this basic rule somewhere in these early chapters and end up trying to force Fortune’s metaphor to fit current scientific notions of atomic structure or vice versa. This isn’t helpful at all when you’re trying to make sense of the basic concepts of occult philosophy expressed in terms of visual metaphors -- which is after all what we’re doing here. With this in mind, let’s proceed to the text. The chapter begins with a crisp summary of the nature of Fortune’s (metaphorical) atoms: they consist of two opposing movements locked into a relationship with each other so that they spin around each other. I suspect Fortune had the Yin-Yang symbol in mind when she wrote this; whether or not this is true, it makes a fitting visual emblem of the concept in question. While the two movements that form the atom are locked into their relationship, the vortex they form by their spinning isn’t frozen in place; it can move. Fortune’s metaphor likens this to a waterspout drifting over the sea, but as I write this, another metaphor comes forcefully to mind. Just as the Cosmos in The Cosmic Doctrine consists solely of movements in space, a hurricane like the one currently bearing down on the US east coast consists solely of movements in warm wet air; a hurricane is a vortex surrounding a Central Stillness; and it moves according to a complex logic of its own, veering this way and that in response to the atmospheric conditions around it. Replace atmospheric conditions with movements in space, and the same is true of the vortices Fortune describes. Left to themselves, given the principles we’ve already covered, the atoms would probably move in circles, but they’re not left to themselves. They’re formed in the seething cauldron of energies of the Central Sun, in the angles where the Twelve Rays interpenetrate, and so as they’re born they’re jostled and shoved and flung from side to side, and so they end up moving in sudden, jerky, angular patterns. These settle out into geometric patterns -- triangles, squares, pentagons, and so on up to decagons (ten-sided figures). Just as a planet has two motions -- it spins around its own axis, and it also revolves around its sun -- an atom has two motions: the two movements that form it spin around each other, and the vortex created by that spin moves through an angular pattern. Once they have settled into a stable pattern, the atoms can then begin to interact with each other. This takes time, but eventually, atoms moving in parallel come into interaction and become linked together in a common pattern of movement. The more atoms gather together in this way, the more of an attraction the resulting mass exerts on other atoms -- and the more the mass is affected by the tides of the Cosmos, the great patterns of movement set in motion by the Rings, Rays, and Circles. Our text finishes sketching this out, and then plunges straight into one of the most important concepts of The Cosmic Doctrine. Back at the beginning of the first chapter, you were asked to imagine empty space flowing, and told that since space is frictionless, once it starts flowing, it keeps flowing forever. Again, this is a metaphor, but it’s one of immense power and importance. Every movement of space persists forever. If you move the point of a pen an inch across a sheet of paper, that movement sets space in motion, and the motion never goes away. In the normal way of things, such a motion quickly gets absorbed in some larger pattern of movement, but the Cosmos is never quite the same as it would have been if the movement hadn’t happened. This is true of every action, every word, and every thought. Each movement lays down what our text elsewhere calls a “track in space.” When another movement more or less parallel to the first takes place, it will tend to be drawn into that track in space, and to the extent that it follows the track, it reinforces it. As more movements repeat the same motion, following the track left by the original movement, the track becomes more and more strongly fixed, so that any movement that even roughly approximates the original movement will be drawn into the track and follow along the original movement. The same rule also applies, however, beyond the personal level. A few years back a scientist named Rupert Sheldrake ran experiments that demonstrated this effect. He showed, for example, that English schoolchildren who didn’t know a word of Japanese were able to learn a Japanese children’s song faster than they learned a sequence of nonsense syllables set to the same tune. Why? Because generations of Japanese children, learning that song, laid down tracks in space that the English schoolchildren could follow half the world away. Sheldrake’s book A New Science of Life was duly denounced in the scientific literature -- the dogma that material effects can only have material causes is deeply entrenched in scientific thought -- but nobody ever proved that his experimental evidence was invalid. To students of occult philosophy, however, Sheldrake’s book came as no surprise, not least because The Cosmic Doctrine discussed the same effect half a century in advance. It’s precisely because repetition has the effects it does that so many occultists perform a single ritual daily, and permit changes in important ceremonies only for very good reasons. Spontaneity has its own gifts to offer, but far more often than we realize, when we think we’re being spontaneous, we’re simply following a set of tracks in space laid down by others in the past. The implications of this principle reach very far indeed. Several of the implications are discussed in the next few paragraphs of our text. First we learn that as the prime atoms come into being and organize themselves, they are drawn into patterns of movement already set in motion -- the great patterns of the Rings, Rays, and Circles that form the Cosmos. Over time, as a result, each of the great composite atoms that emerge from the Central Stillness takes on the form of a miniature Cosmos. Much of the rest of The Cosmic Doctrine focuses on what happens within those smaller Cosmoi, which Fortune and the scientists of her time called Universes, and which we now call solar systems. The same rule then applies to the things that come into being within those solar systems, including you and me. Everything that exists is conditioned by the larger system in which it exists. In the words of the Emerald Tablet, the great foundational text of ancient alchemy: “That which is above is as that which is below, and that which is below is as that which is above, to perform the miracles of the One Thing.” That rule applies at all levels. Any pattern of movements that establishes itself as a steady rhythm becomes a foundation on which later realities must build. 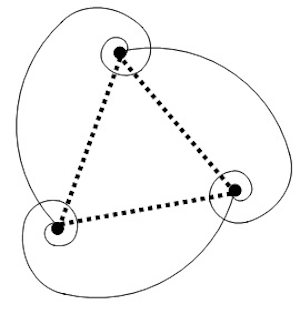 The text asks us to imagine a prime atom that moves in a triangular pattern because of the influences acting on it at the time of its formation. As it interacts with other forces, the basic triangular movement becomes modified into a pattern of three interwoven spiraling movements, a little like that shown in the diagram. Behind that complex pattern lies the simple geometry of the equilateral triangle, shown by the dotted lines. Take this metaphor and apply it, and it becomes possible to see how, behind the intricately interwoven spirals of life, a scaffolding of basic patterns can be traced. Understand the patterns and you understand where the spirals are going and why. Each prime atom, in Fortune’s metaphor, consists of just such a pattern of spirals traced around one of eight possible geometrical figures, from the triangle to the decagon. Each prime atom forms connections with other atoms that have the same geometrical basis -- as our text says, “whose angles of stress are similar” -- and the composite atoms that result begin to drift outward from the Central Stillness, following the lines of one of the Rays and passing from the center into the first of the Circles. There the composite atoms unite with other composite atoms of the same basic geometry to create even more complex composites, and these then drift out into the Second Circle, where the process repeats with similar results. Eventually the whole Cosmos, right out to the Ring-Pass-Not, is full of atoms, ranging from prime atoms in their pure state in the Central Stillness to unimaginably complex atoms in the Seventh Circle. It’s when some of these extremely complex atoms take on one more level of complexity that the process of Cosmic evolution proceeds to its next phase. We’ll discuss that next month. As already noted, The Cosmic Doctrine is heavy going, especially for those who don’t have any previous exposure to occult philosophy. It’s useful to read through the assigned chapter once or twice, trying to get an overview, but after that take it a bit at a time. The best option for most people seems to be to set aside five or ten minutes a day during the month you spend on this chapter. During that daily session, take one short paragraph or half of a long one, read it closely, and think about what you’ve read, while picturing in your mind’s eye the image you’ve been given for that passage of text. There are a lot of images in this chapter, so take your time and try to imagine each one as clearly as you can. As you do this, you’re likely to find yourself facing questions that the text doesn’t answer. Some of those are questions Fortune wants you to ask yourself, either because they’ll be answered later in the book or because they will encourage you to think in ways that will help you learn what the text has to say. It can be helpful to keep a notebook in which to write down such questions, as well as whatever thoughts and insights might come to you as you study the text. Questions and comments can also be posted here for discussion. (I’d like to ask that only questions and comments relevant to The Cosmic Doctrine be posted here, to help keep things on topic.) We’ll go on to the next piece of the text on October 10. Until then, have at it!